Extra Trains Scheduled for 2012 Komen St. Louis Race for the Cure; Take MetroLink or MetroBus to the Event! 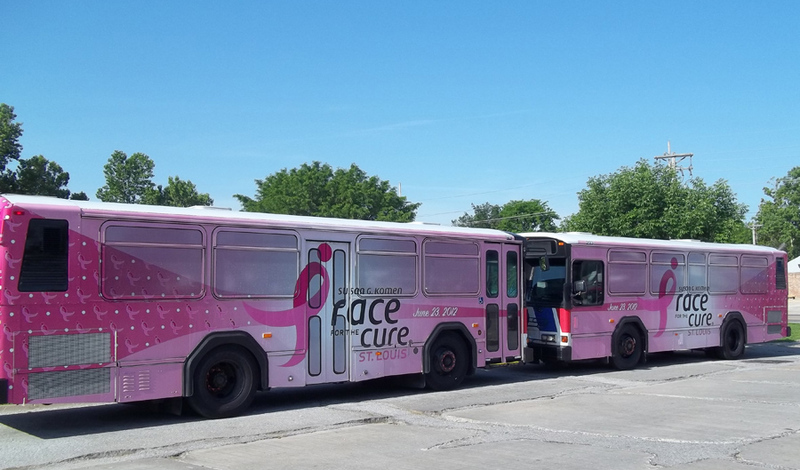 Metro Transit will operate extra service tomorrow morning, June 23, to accommodate the large crowd expected to attend the 2012 Susan G. Komen St. Louis Race for the Cure in downtown St. Louis. Last year, more than 64,000 women, men and children participated in the annual event and attendance is expected to be even higher this year. Metro will have extra staff, including more than two dozen ticket agents at high traffic MetroLink stations, to assist passengers. Trains will operate a modified Saturday schedule until noon with service every 7 and a half minutes at the stations between Fairview Heights and Forest Park-DeBaliviere and service every 15 minutes at the stations east of Fairview Heights, between Forest Park-DeBaliviere and Lambert Airport Terminal #1, and between Forest Park-DeBaliviere and Shrewsbury. Participants can also use MetroBus to get downtown conveniently to the Civic Center Transit Center, which is only a few blocks south of the race grounds. Use the #4, #8, #10, #11, #30, #32, #41, #73, #74, #80, #94, #97 MetroBus routes to arrive in downtown St. Louis. Since numerous downtown streets will be closed for the Komen St. Louis Race for the Cure, it is necessary to detour some MetroBus routes around the closed streets. Here is all the reroute information for using MetroBus to get downtown. Some Metro park-ride lots such as North Hanley, Shrewsbury and Fairview Heights will fill up quickly in the morning so customers are advised to leave early and consider using other park-ride lots like the Brentwood I-64 garage in Missouri, and parking at the Swansea or East Riverfront MetroLink Stations in Illinois. Look for the Susan G. Komen MetroBuses at the Race for the Cure tomorrow. Good luck and happy racing and walking to Team Metro and all participants.